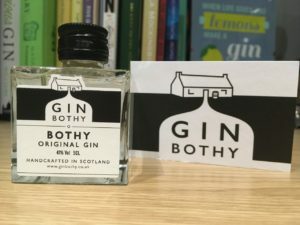 Note: I contacted the Gin Bothy team about International Scottish Gin Day and they kindly sent me a sample to try, but as always I’ll let you know what I really think. You might have seen my post about the original Gin Bothy, but today we try their Gunshot infused gin. This is proper small batch gin, they make just 38 bottles of this at a time which is distilled and infused for up to four months. They call this the “gin for whisky lovers”. Which is interesting for a country so steeped in whisky history – although the advantage being that this is rested for four months, not a minimum of three years. It opens an interesting debate around interchangeable spirits, but this is a debate that this blog doesn’t have the space for right now (or, frankly, the brain capacity or knowledge). The ‘gunshot’ they infuse their gin with is actually cinnamon, cloves and mixed spices (and it is worth noting this is bottled at 37.5% rather than the 41% of their original gin), they recommend filling your hip flask with this for a day’s hiking, or mixing it with ginger ale. I’m all about mixing gin with ginger, but how does it taste with classic tonic? 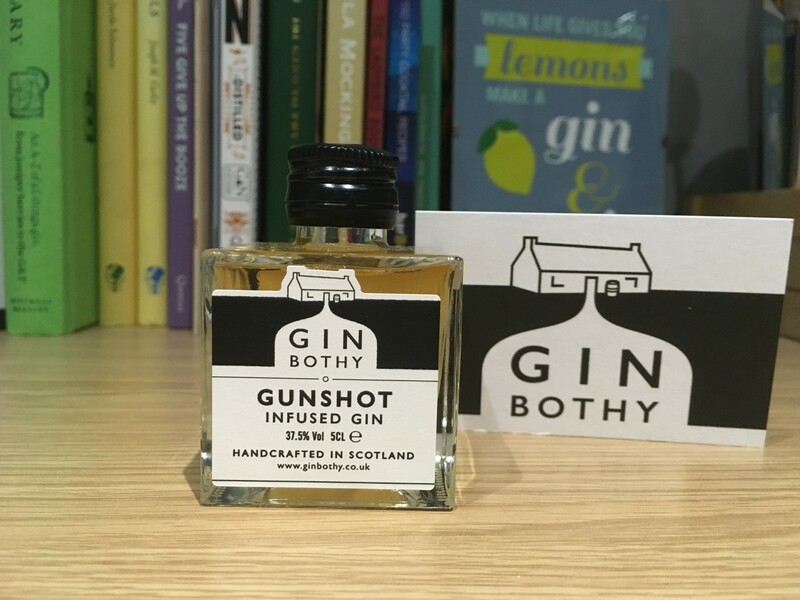 Note: I contacted the Gin Bothy team and they sent me a sample to try, but as always I’ll let you know what I really think. What’s a bothy you ask? The Cambridge Dictionary says “(in Scotland) a small, simple building on a hill for walkers to shelter in, or one that is used on a farm for workers to live in”. 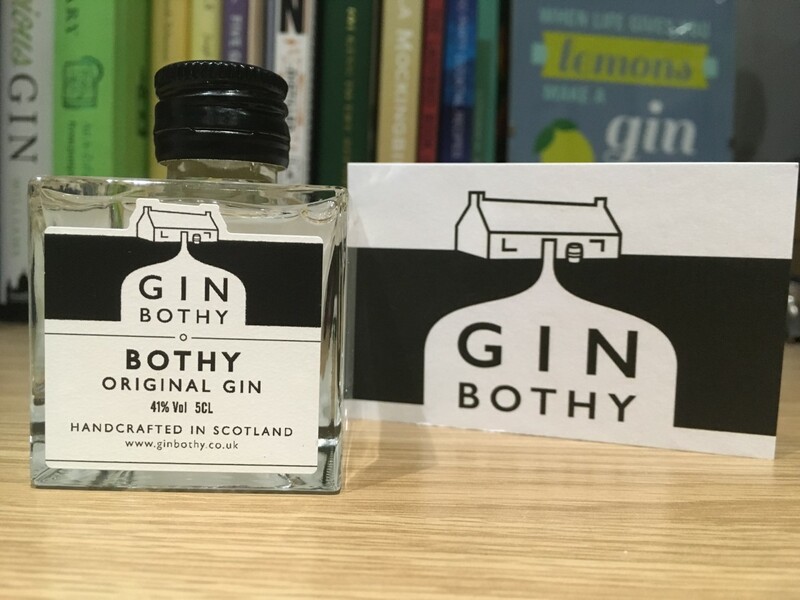 The Gin Bothy team reflect on this history and heritage and pledged to keep this at the core of their work. They use traditional methods to make their gin, using local produce such as pine needles and heather – they also have a range of fruit gins that use Scottish berries and rhubarb as botanicals. The respect for the land around them doesn’t end there, £1 from every bottle sold is donated to the Woodland Trust to regenerate the local forests that supply them with their botanicals. Starting life by infusing gin with leftover fruit jams, their range is extensive but today we try their original gin. Here is where they use their pine needles and heather alongside milk thistle, hawthorn root and rosemary which they say invokes the memory of Scottish forests. So, how does it taste? 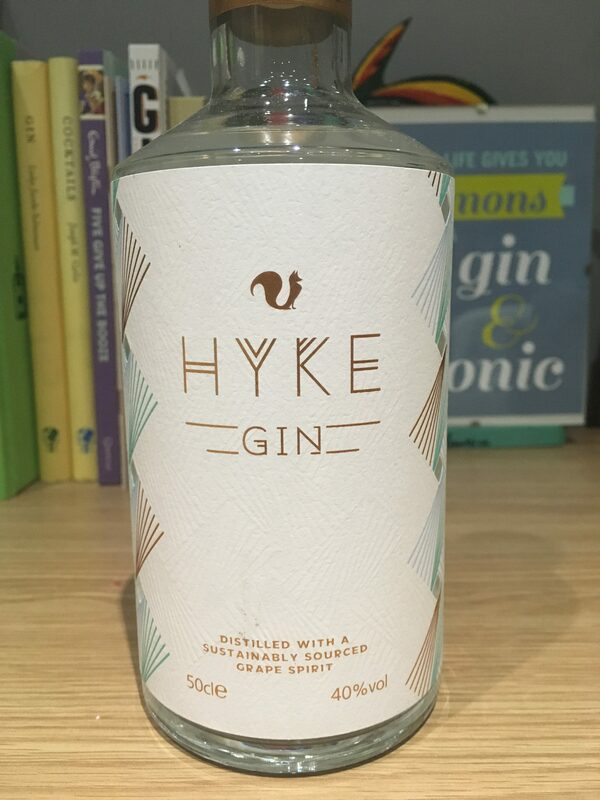 Note: I contacted Foxhole spirits when I heard about Hyke gin and they kindly sent me a bottle to try, but as always I will let you know what I really think. 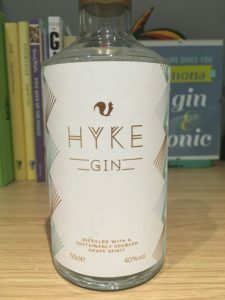 As an avid reader, I know you’ll remember my review of Foxhole gin, and Foxhole spirits have gone on to create HYKE gin. Similar to Foxhole, they use surplus grapes to create their base spirit – did you know that around 713 tonnes of grapes are not suitable for consumption so would go to waste? Once the base spirit has been made, they distil this with botanicals inspired by their grapes’ African and South American roots – juniper, coriander, aniseed, rooibos, myrrh, bay leaf and lemon zest. All in all, a slightly random mix of botanicals, but they say this creates a gin that leads with sweet citrus before spice and ‘complex aromatics’ kick in. The gin, with its beautiful labels, will be exclusively available in Tesco as part of their commitment to cut food waste by one-fifth within a decade. 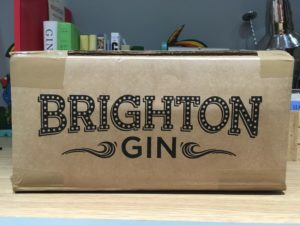 Note: I contacted the Brighton Gin team who kindly sent me sample of their new Seaside Strength gin to try, but as always I’ll let you know what I really think. If you cast your mind back to 15 December 2014, you might remember I published my first ever blog post. Oh how the four years have flown. 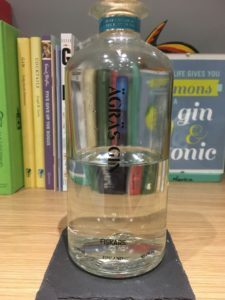 The first post was written by an inexperienced but enthusiastic gin drinker trying the new Brighton Gin which I had very excitedly reserved at a shop wayyyyyy out of my way and collected exhausted after a holiday to Stockholm. In the time it has taken for me to sort of learn what I’m doing, the Brighton Gin team have been going from strength to strength and have just added a new edition to their family – the 57% Seaside Strength gin. Made in Brighton Gin tradition, each small batch bottle is filled, waxed and labelled by hand but this gin hits you with citrus in the nose using candied orange, juniper and “notes of spice” but they don’t say what. What they do say is that this gin is smooth and perfect for drinking neat, or with tonic and lime. So, how does it taste? I’m a fan of Pothecary gin, so when they announced their new Trinity Blend, I was excited to give it a try (thank you to Martin for kindly sending me a bottle). 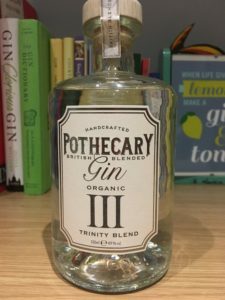 I’ve written about their British blended gin here, and tried their Thai blend (which is delicious) at Junipalooza. So, what makes the Trinity blend different? This gin was created as a rebellion; a rebellion against all that is wrong with gin, the pink gins, the glittery gins, the liqueurs masquerading as gins, the list goes on. Instead, they use just three botanicals: juniper, coriander, and bergamot. I am a BIG fan of bergamot, if you are too I’d recommend trying Italicus which is delicious with prosecco. I digress. So, a brand I like and three flavours I love – plus a hike up to 49% ABV AND it’s still organic. So, how does it taste? If you have a TV, you’ll have seen Lidl’s adverts doing the whole “You can buy X from Tesco for £Y, or you can come to Lidl and buy A, B, C, D and E for less than £Y”. One of those adverts features their own brand gin, Hortus. 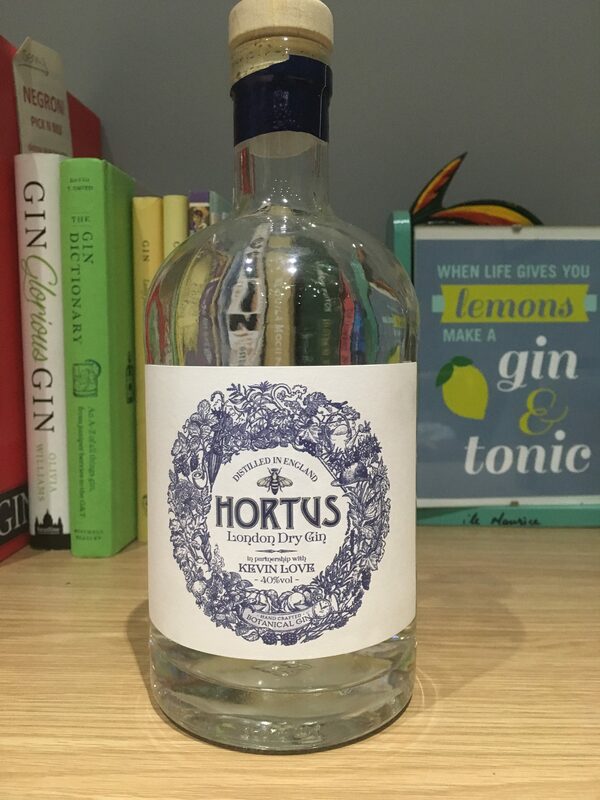 Developed with Kevin Love, a Michelin-starred chef (and prodige of Heston Blumenthal), Hortus ranked higher than big brands Gordon’s and Thomas Dakin in a blind taste test run by Good Housekeeping Institute (coming 7th overall) and winning a silver medal at the ISC 2016. They use botanicals such as lavender, lemon verbena, rosemary and cubeb in their London Dry gin, as well as producing some limited edition seasonal variations. 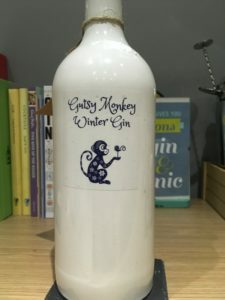 For most people, craft gin comes at a price too high to drink all the time, so if this really tastes as good as some craft gins but for a fraction of the cost, this could be why it is proving so popular with gin drinkers. Heads up, this is another bottle that I adore. A ceramic bottle is massively underused (admittedly, it’s a cost thing) but Gutsy Monkey keep it simple and allow the bottle to draw you in. The team at Gin Kitchen have four spirits in their range: the Blushing Monkey uses black grapes to add a hint of pink to the gin; the Eternal Absinthe uses rose petals; and the Dancing Dragontail mixes aromatic green cardamom with pink grapefruit. Today however we are drinking their Winter Gin which mixes juniper with fresh lime zest, ginger and thyme, before adding some warmth from allspice, black pepper and cumin. Coming in at 48% ABV, I’m imaging this packs quite the punch. 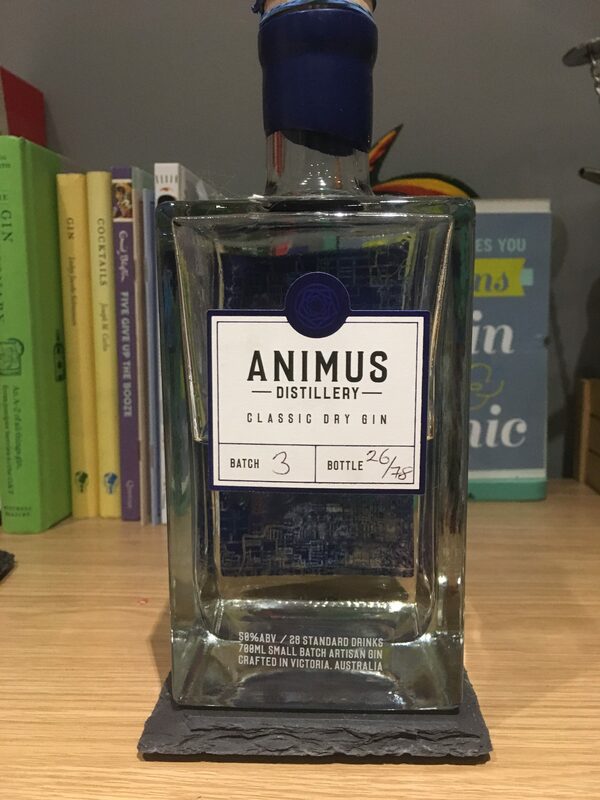 An Australian distillery founded by four friends – no it’s not Four Pillars, it’s Animus Distillery. Founded in 2015 in their garage, they soon expanded into their rural property in Central Victoria (about an hour from Melbourne). Their grain spirit is triple filtered through a custom made gravity-fed carbon filter before being vapour distilled – in fact many of their botanicals are grown on their farm. They are another brand with a big focus on sustainability, they reuse their botanicals as fertiliser and use recyclable materials in their packaging. They currently have four gins in their range: Abrosian gin with a South East Asian influences of mandarin, kaffir lime, galangal and ginger; Arboretum gin which utilises estate grown herbs lemon thyme, rosemary and native bush tomato; Davidsonia gin which is their take on a British sloe gin using a tropical sour plum with is steeped in their Macedon gin for a number of months. Speaking of the Macedon gin, that’s what we are trying today which is a London dry style using lemon myrtle and mountain pepper berry alongside juniper, cardamom, cloves, cinnamon, star anise and rosemary amongst many others. 987 gin is a Spanish London dry gin which goes through eight distillations. They macerate 14 botanicals including juniper, vanilla pods, thyme, bitter chamomile, lavender and mencia wine (a red grape with floral and red fruit flavours). These are combined with citrus fruits in copper pot stills with neutral grain spirit which was distilled five times, before being filtered and bottled by hand. They say the gin has heavy juniper and herbs on the nose, with the wine base bringing a combination of sweet and spice. 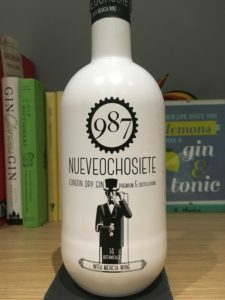 The distillery also makes 987 Lollipop gin which uses cherries as their main flavour and their own premium red vermouth. 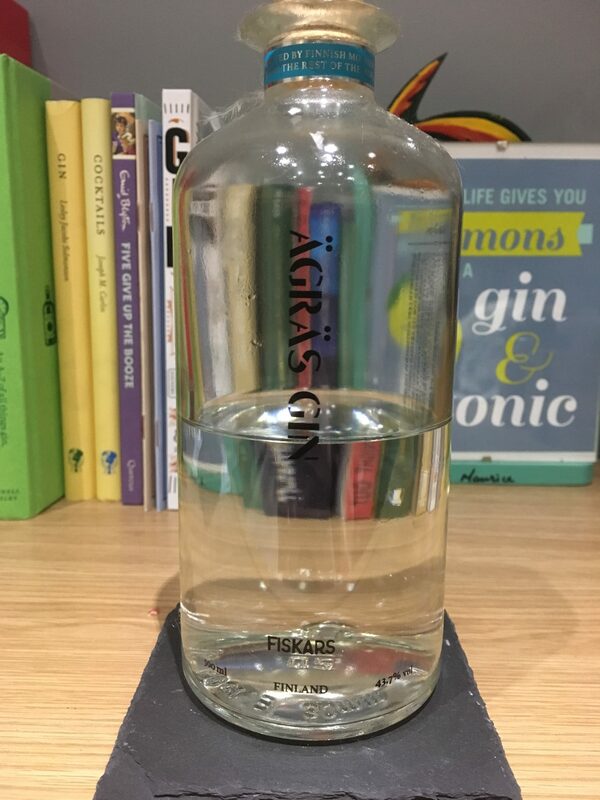 Today’s gin hails from Finland; the Ägräs gin distillery is in Fiskars Village, an old ironworks village 88km west of Helsinki. The distillery takes it’s name from the ancient Finnish god of vegetation, and they use just four botanicals (juniper, red clover, angelica and lemon peel) sourced from the forests of Finland. The distillery is the first crowdfunded distillery in Finland, with over 500 shareholders and now make their gin, an Akvavit, and the limited edition Abloom gin which takes their standard gin mixed with hibiscus flowers and honey.